Fake It 'Til You Make It Is BAD Business! - Go Creative Go! Fake It ’Til You Make It Is BAD Business! 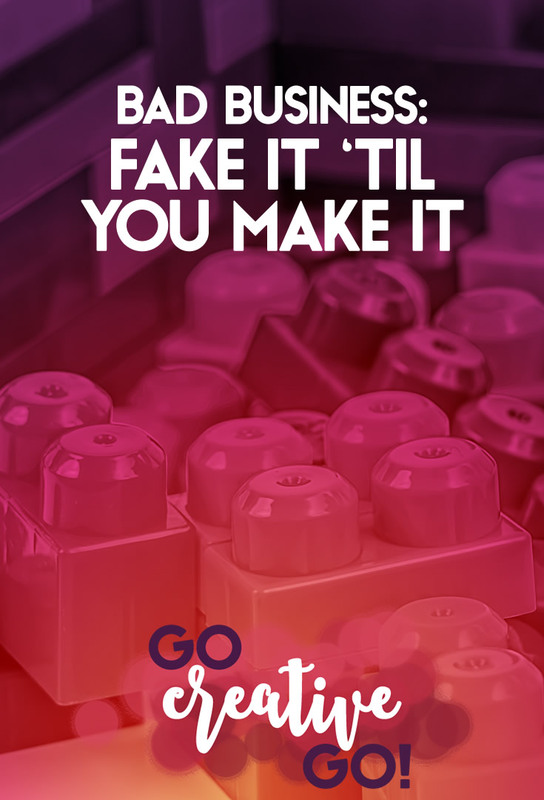 Fake it ’til you make it is possibly my least favorite of the ridiculous buzz phrases making their way around the Internet of late. I loathe and despise this phrase. Every time I see it I swear you can see smoke come out of my ears! Let me make something abundantly clear. I know that faking an outgoing personality at a networking event is nowhere near as damning as faking expertise of a skill-set or solution when trying to land a paying client. That being said, I still think any level of fakery is a faux pas best avoided when it comes to doing business. Most of your audience, if you’ve done a good job of cultivating the right connections and engaged in the right conversations, is made up of smart folks. And when they can’t immediately flag the fakery, they’re left feeling suspicious, which does NOT bode well for a smart and savvy future relationship. Acting confident when you’re feeling anything but is not a crime. However, I dare say that when you fake a feeling, it often shows you in an unflattering light. Confidence faked often comes across as cocky, making the one faking look like a braggart and loudmouth. I personally believe there’s nothing wrong with smartly sharing nerves and/or vulnerability. That prospect is feeling a bit vulnerable about investing his or her hard earned dollars in your proposed solution. While you certainly don’t want to come across as wet behind the ears or numbingly nervous, there’s nothing wrong with sharing some excitement and anticipation about working on the project. In doing so, I’ve actually landed clients who were on the fence, because they want to work with someone who cares about the project as much as they do! When you fake a skill set or a level of expertise, even if you manage to learn on the fly during a project, you’re hurting your client and yourself. Did you tell the client you were using them as a guinea pig while you learned to code? If not, you’ve actually lied to your client. Saying you CAN do something you’ve never done before, when accepting money for expertise, runs the gamut from petty theft to flat out highway robbery. Sure, you might manage to get the job done and you might manage to get it done well. But, and this is a BIGg but, that’s not always going to be the case. When you learn as you go, without acknowledging it up front, you open a project to delays and scope creep. What if you’re developing a web site and you realize you can’t hard code the solution. You have to use a premium plug-in to get the job done right. The client isn’t going to be happy about the extra cost or the time to implement the new plug-in, and now you’ve shown yourself as inexpert. Your working relationship is now on shaky ground. But … I’ll Look Bad If I Say I Can’t! When you honestly say you can’t complete a task you are being honest and open with your prospect, peer or current client. AND you now have the opportunity to better showcase your expertise by offering to bring in a colleague to collaborate on the project in order to ensure it is done right the first time. How many times have you listened to a prospect telling you that he or she got hosed on their last graphic design, web development or social media marketing project? Do you want to be the contractor that past client is bemoaning when the project has to be tackled again? Of course not! Fess Up, Don’t Fake It! I’m a big believer in the idea of “fess up before you mess up.” But I want to take that idea one step further. You’ll be doing yourself, your reputation and your clients a favor. I agree whole-heartedly, Mallie. Being that we both work in the social media arena, it is impossible to always “keep up” with the latest trends. When a client asks – can you use Periscope or Blab or any of the other newly created stuff and my answer is, “nope, I can’t”, has immediately impressed my potential clients as a trustworthy, honest person – far more important than a Jack of all Trades. Nice post – will share. Thanks, Laurie. And I couldn’t agree more about the trust-building potential of saying no, I can’t, that’s not in my skill set, etc. We are constantly censored with the idea of authenticity. There’s nothing authentic about saying you can do something for which you don’t possess the skills and expertise. Bravo! This is so true. I’ve learned it the hard way, too. Above and beyond the lying, if you’re taking work that you don’t really know how to do, it’ll cause you a lot more stress than it’s worth! I’ve learned to focus on doing what I know and love. That’s great, Ashleigh. We’ve got to stop feeling like we have to say yes to everything in order to be successful. There are jobs we should not take and there are jobs we flat out can’t take. Knowing this is actually quite freeing, don’t you think?